"Tremendously useful to me in my work"
I received your book last week and am so impressed I had to drop you a note. I'm only halfway through -- still absorbing the concepts you present -- and it is already tremendously useful to me in my work. For example, last night during a session with my most challenging client, I experienced his resistance in a completely new way: instead of feeling like a source of frustration to me, it became a place of great therapeutic opportunity for the client. He was more vulnerable and engaged than ever and his work took on an organic "flow" which was remarkable to experience. I'm new to the field, still learning what counseling is and is not, and your book is, by far, the best presentation of the therapeutic relationship I've yet run across. It makes me feel excited again about being a counselor and instills hope in me that I can actually help my clients change. A practical resource for therapists at all levels of experience. Seasoned therapists will find a fresh approach for many of the most common and frustrating client interactions. Students will find helpful tips to develop confidence to work with clients while practicing various therapeutic techniques. Dr. Mitchell presents the material in a no-nonsense, sometimes humorous style that is clear and concise. You will find yourself returning to review the techniques in this manual frequently. The next evolution in counseling. I work with involuntary clients in a lock-down facility for delinquent juveniles and dealing with heavy resistance is a daily struggle. The methods I've used from this book have greatly improved my success in gaining cooperation and participation during counseling sessions. It's also relieved a lot of stress. In this book you will find a new way of viewing resistance. It is approached as a product of the interaction between therapist and client instead of an internal client trait. It is a special form of communication from the client, and when handled skillfully, it can actually be used to move therapy forward. I love the Aikido metaphor he uses to make this point. Responding to the resistance to change is also viewed as the heart of all therapy because without it people wouldn't be in therapy in the first place. In addition, he covers the importance of eliciting the "desire side" of change to boost client motivation, the importance of being sensitive to the client's stage of change using the transtheoretical model of change, and the importance of collaborative goal creation to keep therapy moving in a positive direction. This book cuts to the chase by bypassing elaborate theory to get right to case examples that illustrate the methods and techniques described. The metaphors and excerpted quotes promote the quick understanding of the material even further. At first glance it may appear to be just a book of techniques, but it is actually a complete approach to therapy and is built on the foundation of Rogers' Person-Centered Therapy. This book also makes an excellent compliment to Miller and Rollnick's Motivational Interviewing. The only criticism I have is that I would have liked to have seen an extended transcript from a collection of actual sessions with a single client that illustrate the techniques as that client moves through the stages of change. "Stop resisting and buy this book! Simply put, it is the most practical book ever written on managing resistance. Your clients will be glad you read it!" Recommended for both business management and industrial psychology community library shelves. All Businesses have them - those difficult clients who come in and only seem to make the day seem to drag out longer and longer. 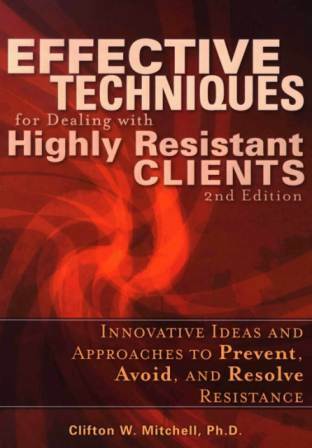 "Effective Techniques for Dealing with Highly Resistant Clients, 2nd Edition" will lay out everything the reader need to know to deal with these formerly dreaded but valuable people. Written with practicality in mind, it teaches readers nine common errors therapists make that foster resistance, use the inherent power of language to create movement, the problem of over questioning, managing difficult responses, dealing with awkward silences and specific techniques to manage it all. Recommended for both business management and industrial psychology community library shelves. “Dr. Mitchell’s book is a welcome addition to the marketplace for clinicians working with challenging clients. This book is an extremely practical “how-to” guide for clinicians who ever feel stuck, stymied or in some way blocked in their work with clients (all of us at some point). It is concise, well-written and provides a treasure trove of strategies for managing any difficult client situation. Buy this book and watch your work with clients improve dramatically!” Mitch R. Abblett, Ph.D., Author of “The Heat of the Moment in Treatment: Mindful Management of Difficult Clients” and Clinical Director of The Manville School at Judge Baker Children’s Center in Boston, MA.